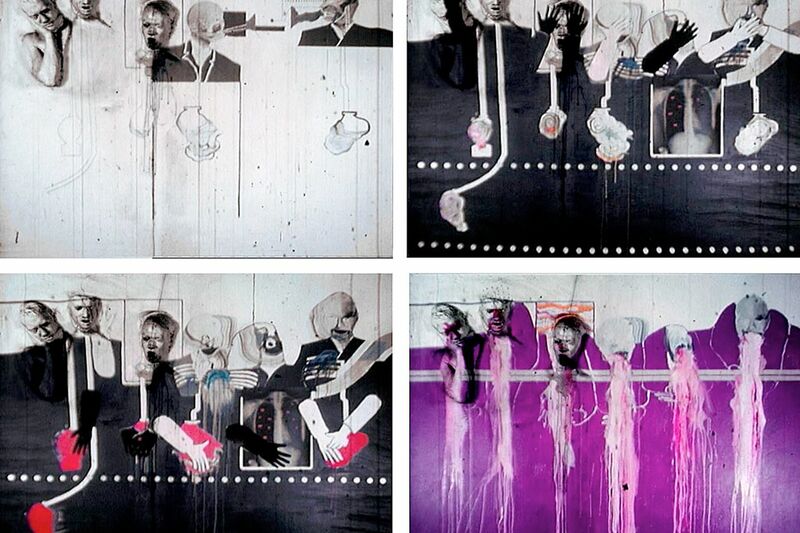 "Six Men Getting Sick," David Lynch's 1967 combination of sculpture and film projection, reflects his preoccupation with the external and the hidden. Many of David Lynch's paintings and drawings contain enigmatic bits of writing. Most often they are scrawled, though sometimes their letters are cut out and pasted on, like ransom notes from the subconscious. "Suddenly my house became a tree of sores," says one very dark, thickly layered piece from 1990. "oh, I have made a mess," says a lower-case 2009 lithograph, which shows a crudely drawn man, his hands on his cheeks, Scream-style, as he contemplates a great black pile of who knows what. "holding onto the Relative with one Eye on Heaven," says a another lower-case work, a 2008 mixed-media piece depicting a figure with very long, waving hair and hyperextended twig arms standing in a romantic alpine landscape, against a sky that is the only large expanse of blue in an otherwise soot-gray, mud-brown, blood-red show. "I NOT KNOW GUN WAS LOADED, sorry," says an all-caps, almost black watercolor, showing a large, smoking pistol and a tiny figure. It seems to make sense that Lynch, known primarily as the maker of a handful of memorable movies - and of Twin Peaks, probably the oddest television series of all time - should turn out to be a narrative artist, a storyteller. Indeed, he readily accepted that characterization in response to a question before the opening of the current show "David Lynch: The Unified Field" at the Pennsylvania Academy of the Fine Arts. He added that he expects that viewers will imagine what happened a few frames before and a few frames after the picture he shows us. The premise of the show, as Robert Cozzolino, senior curator at PAFA and chief organizer of the exhibition explained it, is that Lynch was a visual artist before he became a filmmaker, and he has never stopped working in a variety of media. Cozzolino calls visual art the "through-line" of Lynch's career, even though this is the first U.S. museum showing of his non-cinematic work. Lynch clearly values his time here, though none of the city's tourism promoters are likely to embrace his rhapsodic description of the mood he found: "Fear, insanity, corruption, filth, despair, and the violence in the air was so beautiful to me." He came to Philadelphia as a young man with great, undirected talent, and he left ready to embark on Eraserhead, the darkly obsessive 1977 film that launched his career. At the academy, he made his first motion picture, a one-minute projection upon a screen that was actually a sculptural relief with several heads, Six Men Getting Sick. The work, on display in this exhibition for the first time since it was shown in 1967 only a few feet away in the same gallery, won the Dr. William S. Biddle Cadwalader Memorial Prize. It's an amazing piece, crude and ahead of its time. In this one minute of film, we can see a lot of Lynch's preoccupations, especially his desire to show the external and the hidden - in this case internal organs - both at once. And the vomit is painterly, almost a parody of abstract expressionism. By this time, you can understand that Lynch was ready to move beyond the classical training the academy had to offer. This is a good story on which to ground the exhibition, though viewers who come looking for art that tells them anything about Philadelphia are likely to be disappointed. The Philadelphia works show a young artist clearly enthralled with the distortion and savagery of Francis Bacon's paintings. He was also fascinated with texture, incorporating used cigarette filters, horsehair, and plastic resin to make the works more alive and icky. All the Philadelphia-related works are in the first and smallest of the exhibition's three galleries. Most of the rest are from the last two decades, with only a handful from the period when Lynch was most actively making movies. The second of the galleries, on the theme of home, is the heart of the show and of Lynch's art. Home, Lynch has said, "is a place where things can go wrong," and as in his films, we feel that the wrong was there all along. The same sensibility is obviously at work in the art and in the films. The question really is whether this art is a footnote to the films, or a different, necessary sort of expression. I think the answer goes back to my first thoughts about storytelling. As I thought about the films, I couldn't remember any of the stories, only striking images, scary eccentric characters, and a cool, stylish overlay. The art gives Lynch a chance to lose his cool. The prints and smaller pieces are bold and self-consciously crude. In the big works, done on wood panel and cardboard, the paint is literally troweled on, along with sticks, working electric lights, dolls, textiles, teeth, bones, dice, and who knows what else. (The labels fudge and simply say "mixed media.") They are potent, sensuous, and extreme images that need not accommodate themselves to story, or tone, or actors. What you find here that you rarely see, at least on the surface of a Lynch film, is passion. You may not understand the orange canvas with the red demon at the center, with the words, "Because of wayward activity based on unproductive thinking BOB meets mister REDMAN." You almost certainly won't understand what "the twisted facilitator" is, though it looks like a bone. But like little Bob, you will cower and say "oh no." Lynch has given us, in a purer and aggressively cruder form, what he always gives us: not Hollywood dreams but shards of nightmares. Through Jan. 11 at the Pennsylvania Academy of the Fine Arts, 118 N. Broad St. Hours: 10 a.m.-5 p.m. Tuesday - Saturday; 11 a.m.-5 p.m. Sunday. Admission: $15 adults; $12 seniors 60 and over, and students with ID; $8 teenagers; free for military personnel and children 12 and under.